For the aesthetic design of Batman: Arkham Asylum, Rocksteady Studios chose to walk a line between the realism of the Christopher Nolan Batman films and the comicbooks. While some characters, such as the Scarecrow, deviated significantly from their comic or movie incarnations, others remained fairly truthful to one form or another. 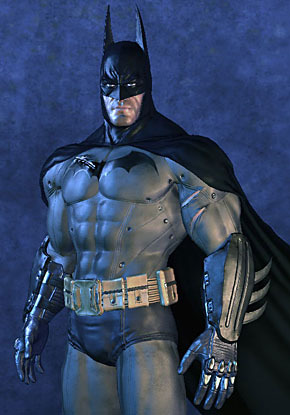 The game's Batman design is a cross between the bulked-up Batman of the "Hush" era, with the black bat symbol and the pouch belt, and the survival suit of The Dark Knight, as evinced by the piping and seams on the uniform and the heavily modified gauntlets and boots. As usual, DC Direct struck with these figures when the iron was ice-cold - they hit stores a good year and a half after the game. The second wave series has already come out and there will be more, including an Asylum Killer Croc and an Arkham City Harley Quinn is due in a "few" months (read: July 2012). DC Direct seems to have an A Squad and a B Squad on their figures these days (mostly at the production level, I think). The A Squad gets the high-profile DC licenses (Green Lantern, Batman Incorporated, World of Warcraft) while the B Squad gets the more obscure stuff, especially videogames (Mass Effect, Dragon Age, God of War). Despite being based on a videogame, it's clear Arkham Asylum got the A Squad. Batman himself was sculpted by Dave Cortes, who also gave us Brown Costume Wolverine and the majority of Mezco's comic-based Hellboy line. It's a great sculpt, primarily based on the game render with perhaps a touch of the marketing art thrown in. The one noticeable difference are that Batman is sporting something more like boxer-briefs, rather than the regular briefs seen on the render. One critique, however - the head is just a bit too small, and a bit off-model. Many recent DCD figures - especially those produced by the aforementioned B Squad - have had heads made from a terrible, vaguely translucent flesh-colored plastic. 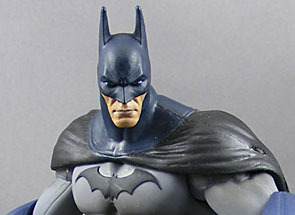 Batman avoids this entirely, with a head made from a more durable material and a painted face. The rest of the body is made from the harder plastic (in comparison to say, DCUC) that is standard on DCD toys. The boots and gauntlets are molded in blue, but the shiny parts appear to be painted (you can see it in the matte blue of the lower part of the boots). The cape is made from a very loose, pliable material. The only sloppy part of the paint are the little silver rivets on the torso and arms - they're inconsistently painted and a bit splotchy (they are, however, part of the design). 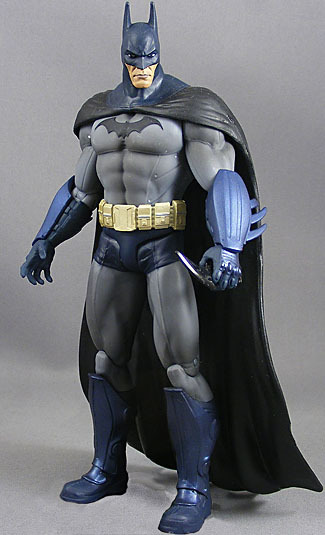 There's been a lot of discussion about the fact that the cape is black while the cowl, boots and gloves are blue. Some say all should be blue, others all black (a close examination of the game itself seems inconclusive, though we lean toward it being all a dark navy blue). But everyone can agree that the blue/black mixture on the figure was a bizarre decision, and it really hurts an otherwise great look. 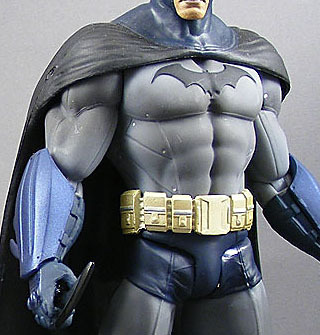 While DC Direct has been making tentative steps toward better articulation, Batman doesn't benefit much from that. He has a ball and socket head, ball-and-hinge shoulders, swivels at the wrists and top of the boots, and hinges at the elbows, hips and knees. 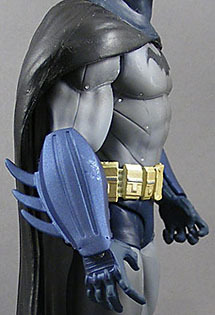 The wrist swivels are limited by the gauntlets and the shoulders are limited by the cape. Using the display stand you can get a few decent action poses, but Batman won't be doing a side-kick to the Joker's head in your AA diorama. 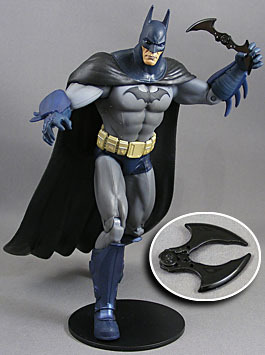 Batman comes with a small black display stand and one other accessory, a batarang. Like in the game, in can be folded in half, which is a nice touch. Unfortunately, collectors have to wait for the Armored Batman in Series 2 to get a grapple gun. More and more, we're seeing toy companies spread out the value of a toyline across an entire wave. Build-a-figures are the most obvious example of this, but it's also seen in dioramas and even in this line. Batman has only the batarang, but the Joker comes with Scarface. We love the sculpt of this figure, and while the cape/cowl color contrast and the splotchy rivets are annoying, it's still a fantastic-looking figure. What keeps it from being my favorite Batman figure ever (though it's up there) is the limited articulation. Still, despite our preferences there's a place for well-sculpted, limited-articulation figures. Besides, I've basically decided to buy every Arkham-related toy, so I've made peace with the lack of articulation.